Are your current windows letting in cold air during the winter? It may be time to replace your old windows with help from Abode Building Center. Poorly designed windows can detract from your home’s aesthetic or make your rooms seem dark. Chase away the shadowy corners with gorgeous window designs from Abode Building Center. When winter comes, you won’t have to worry about the cold seeping in. With our reliable windows you can be cozy throughout the colder months. Natural light is one of the most beautiful assets a room can have. Rooms that seem spacious often have the benefit of generous windows to let in the sunshine. 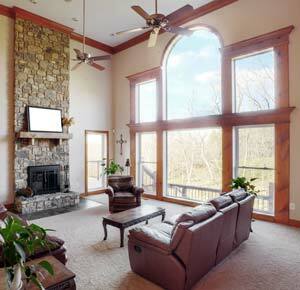 Our professional window installers can transform your living spaces with windows. With beautiful windows, you can throw back the curtains and feel more connected to the outside world. We offer wood/clad and vinyl windows, both of which will last you for years to come. if you are interested in our replacement windows or new construction window services, please feel free to call our Portage office at (269) 329-1800. At Abode Building Center, we are proud to help West Michigan homeowners find new window solutions.